The FIPJP Women’s World Championships are to be held in Monastir, Tunisia, on 2nd-6th October. The SPA therefore invite teams of 3 or 4 women who are willing, committed, able and eligible to represent the SPA to register their interest. We have set aside the 14th April 2013 as a date for a qualifying competition but teams are required to register their interest no later than 20th December 2012 by email to Lynn Jenkins directly or via the form on the contacts page. Please note that the SPA are not able to offer financial assistance for participating players. The Birds ‘n’ Bees Pétanque Club invite you to their annual New Year Chuck Up. Bring your boules and your hangover to the Birds ‘n’ Bees, Easter Cornton Road, Stirling for a 12 noon start on Wednesday 2nd January 2013. Posted in Club News, What's On? 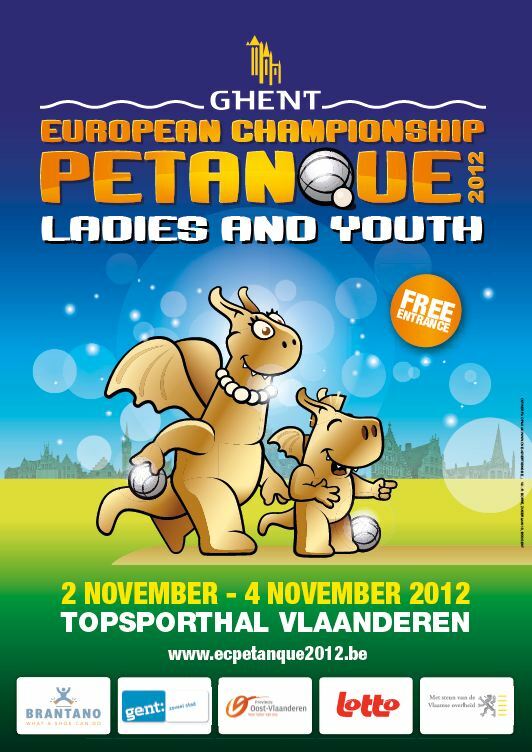 SPA affiliated clubs are invited to register their interest in participating in the Eurocup for Clubs 2013. This may involve one or more foreign trip and/or involve hosting a round of the competition depending upon the draw. Clubs who want to know more about what this entails should contact the SPA or see the competition rules. Clubs who are committed and able to represent the SPA should register their interest by 20th December 2012 either by direct email to Lynn Jenkins or via the form on the contacts page. Please note the SPA will not be able to offer financial assistance. Please note that clubs will need to provide a minimum of 8 lanes (which must be divided by strings) for an event and preferably should provide a non-playing volunteer to assist with timekeeping and with measuring. As a reminder the SPA will run a raffle at each event. Host clubs are offered the opportunity to provide prizes for raffles on the day, the number/quality of prizes will be matched by the SPA wherever possible and in return a half share of the proceeds will be passed to the host club. Clubs may also provide catering for participants if they wish, the SPA do not contribute to this and so all proceeds naturally are retained by the host club. Clubs who wish to be considered for one or more of these events should email Lynn Jenkins directly, or you can fill in the form on the contact page. The deadline for responses is 20th December 2012. The Women’s World Championships will be held in Monastir, Tunisia on 2nd to 6th October. The Junior World Championships will be held in Montauban, France in August. The Men’s European Championships will be held in Rome, Italy on 10th to 13th October. The Espoirs European Finals will be held in Dusseldorf, Germany on 18th to 20th October. The host city Ghent / Gent sits on the confluence of the rivers Scheldt and Lys and is the capital city of the East Flanders Province of the Flemish region of Belgium. Retaining a lot of the original medieval architecture it is a popular tourist destination, a busy port and home to many students. The venue for the Championships was an indoor sports arena named after the famous Belgium cyclist Eddy Merckx. The temporary pistes were laid in the centre of the 200 metre track and on top of a 60 metre sprint track. Plastic boarding (like floorboards) were laid to protect the surface. The boards in turn had approximately 2-3cms of piste spread on top. The top layer was a mixture of gritty sand and stones of up to 2cms. Bounce was a particular problem where the piste overlay the sprint track and also if the edge of a board was hit. The surface dictated the tactics of all but the elite teams. Shooting anything other than boule to boule often resulted in a shunt rather than a clearance. Pointing was difficult with looser boards acting like spring boards if you happened to land on their ends. Scotland (Mari Snell, Christine Thomson, Shirley Legge & Lynn Jenkins) were drawn in qualification Group G. The other teams being, Switzerland, Belgium 2 and Russia. The draw also meant that Shirley would be in the last group in the shooting competition. With little or no practice being allowed in the arena this was an added pressure that was compounded by an error in the draw. We’d no sooner got to our announced lane than it transpired that an error had been made. Eventually we got to the correct lane and had to start. Importantly Shirley scored some points and will have learnt a lot and will be better able to prepare for the next time. After lunch we had the opening Ceremony where the teams enter the arena with their flag and placard and line up for the opening speeches. We were accompanied by a pleasant young Belgium chap to carry the placard and keep us in check. Christine & Mari particularly enjoyed this, their first proper taste of the event and a chance to let off a little tension before the first triples matches. Our first match was against an experienced Swiss team. In at the deep end we fielded Mari, Christine & Lynn with Shirley on standby. Unfortunately the Swiss adapted to the difficult piste far quicker than us and through a better boule average ran out comfortable 13-4 winners. Game two, Belgium 2, Mari, Shirley & Lynn. We now had a better feel for the piste and from the start we gave the fancied Belgium 2 team a fight. Moving Lynn to point moved the pressure on to the Belgium team. They had to play well to slowly eke out a lead and then stretch it 10-5 and then 12-8. We still felt in the game and knew if we could keep up our % of successful boule we may get a Belgium wobble and a chance. Two ends later it was 12-12 and two good points from the opener saw us win 13-12. This gave us a good feeling for the evening and more importantly a chance to qualify for the main competition the next morning. Saturday morning, game 3, Russia, Mari, Shirley & Lynn. Traditionally we have hard & long matches against the Russians. This was no exception. The score was very tight for the first half but Russia played that bit better and kept their concentration to run out deserved 13-8 winners. With Belgium 2 beating Switzerland 13-2 any hopes the Russians or ourselves had of qualifying were gone. The Nations Cup saw us in a group with Austria, Bulgaria and the young ladies from Ireland. Our first match was against Austria; Shirley, Christine & Mari taking the field. Scotland started well but a poor third end saw the scores tied at 4-4. The next ends were hard fought with the lead exchanging hands on a regular basis. After eleven ends we were tied 10-10. Showing good composure we ground out the next two ends to win 13-10. The next match saw Christine, Shirley and Lynn line up against the young Irish team. Two of the Scottish players are older than the combined ages of the Irish lasses. With Christine on fine form on point the Scottish team capitalise on their experience and hold their concentration to win 13-3. The last round of the NC qualifier saw Mari, Christine and Lynn up against Bulgaria for a slot in the knock-out rounds. A poor first end saw us 0-4 down and may have helped return our thoughts to the present. Mari settled the team in the second end to get us off the mark. From there on a solid team performance saw Scotland score steadily to lead 12-4 at the start of end 8. A good performance from Bulgaria stopped the TF but could not stop a win for Scotland at the next end; 13-5. The quarter finals were Slovenia v Slovakia, Scotland v Luxembourg, Russia v Estonia & Norway v Ireland. As expected our match was very tough and both teams used their substitutes. Luxembourg had the early advantage with Scotland hanging on against a strong and experienced team. Our tactic of damage limitation began to affect the opposition. We were aware that they were annoyed that the lead was not getting beyond a few points. We soaked up pressure until we got a chance to land a telling blow. With two boule “in hand” at 5-8 down we were sitting one, but the front was congested. Our second last point hit the guards but improved the presentation of a problem Luxembourg boule. This set up a shoot (last boule) which gave us a five and a 10-8 lead. With the help of this momentum we hung on to secure a 13-12 win and the chance to play on the final day. Our semi-final on Sunday was against Slovenia. 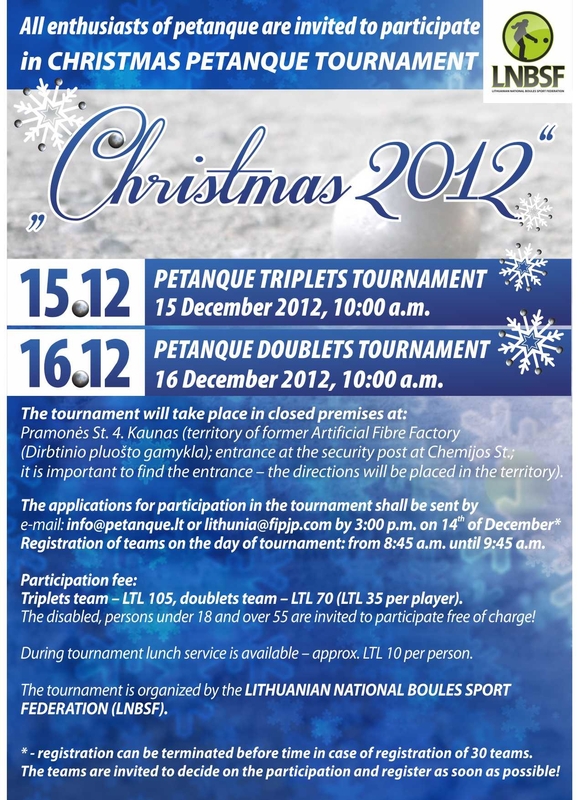 A petanque nation with a good pedigree. The other semi was between Norway and Russia. Again we used all four players to try and get an edge; unfortunately the Slovenia players were in good form and deservedly kept growing their lead to win 13-6. Importantly we made them work and showed them and the crowd that we could play petanque. Norway overcame Russia in the other semi-final by a similar score. In the final Slovenia continued where they left off against Scotland. The Norge team also played well but could not stop Slovenia from winning 13-5. Congratulations to the winners and better luck next time to the rest of us. Having reached the semi-finals it was great to hear that we’d get a trophy rather than a medal at the gala dinner. The gala dinner was a great way to round off the experience, especially for newbie’s Christine and Mari. 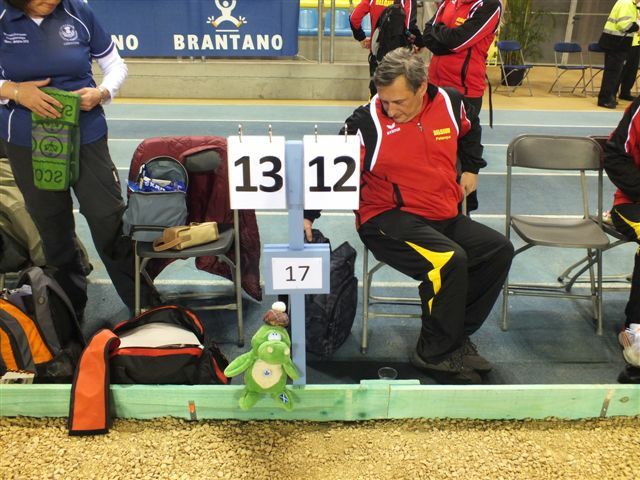 As usually for petanque players, we will have “what if” memories from missed shots but it is important to remember that we held our own in most matches and showed that Scotland can and should compete at the highest level. The contacts we now have should help with invitations to opens in Europe. These offer a great chance to play at a higher level and are usually only limited by entry; first come first served. Interestingly several of our friends from Europe would love the chance to play in Scotland. Colin’s idea of an “open” to celebrate 30 years of the SPA is worth serious consideration. A photo gallery documenting the Scotland Ladies’ visit to Ghent is now available on our Gallery page. A fantastic weekend of pétanque at the Women’s Europeans saw Scotland achieve a marvellous 3rd place in the Nations Cup. More to follow. Christine Thomson, Lynn Jenkins, Mari Snell and Shirley Legge travel to Ghent this week to compete in the Women’s European Championships. We wish them the very best of luck.